It’s that time of the year again, time for baking and taking all kinds of sweets to Christmas gatherings! 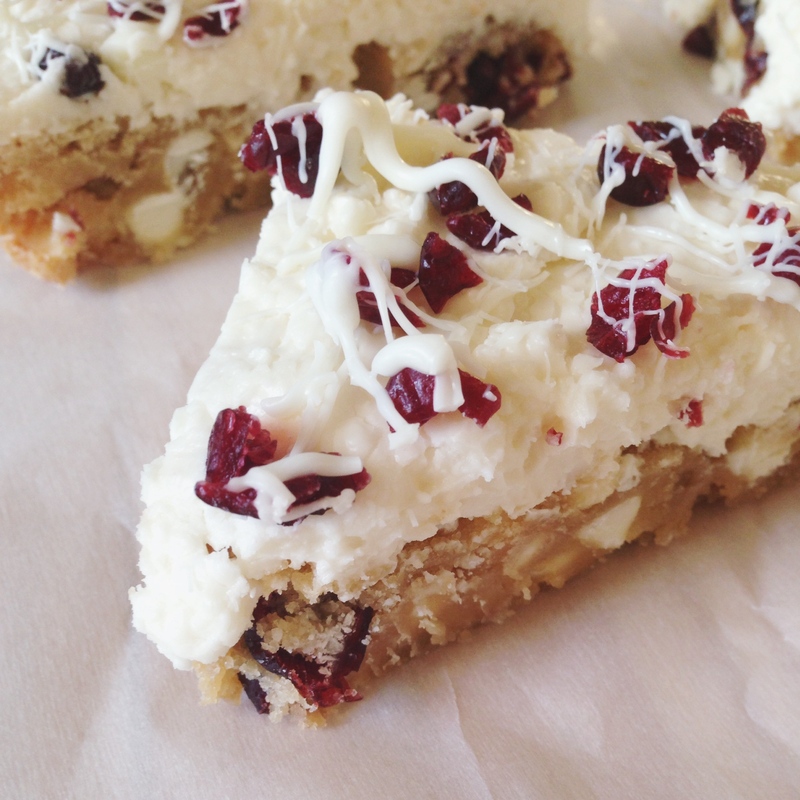 If you’re still searching for a holiday dessert recipe, try these Cranberry Bliss Bars: blondies with the addition of white chocolate chips and tart dried cranberries, iced with cream cheese frosting. I love how festive the colors in this dessert are, it’s perfect for sharing! 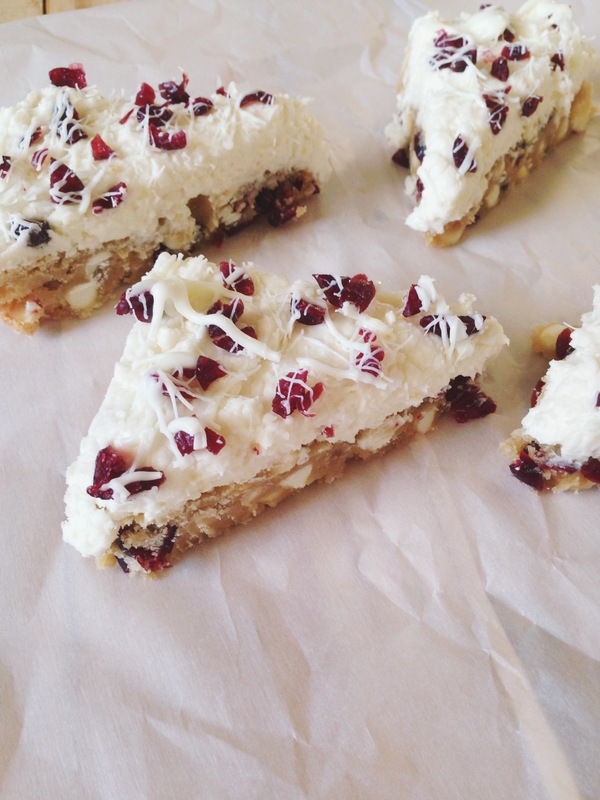 If you hadn’t already guessed, this is a copycat recipe for Starbucks’ Cranberry Bliss Bars. Recipe was slightly altered from here. Preheat oven to 350F. Line an 8-by-8-inch pan with parchment paper and set aside. In a medium microwave-safe bowl, melt the butter. Allow it to cool slightly, then add the egg, brown sugar, and vanilla. Stir to combine. Add the flour and salt, stir until just combined. 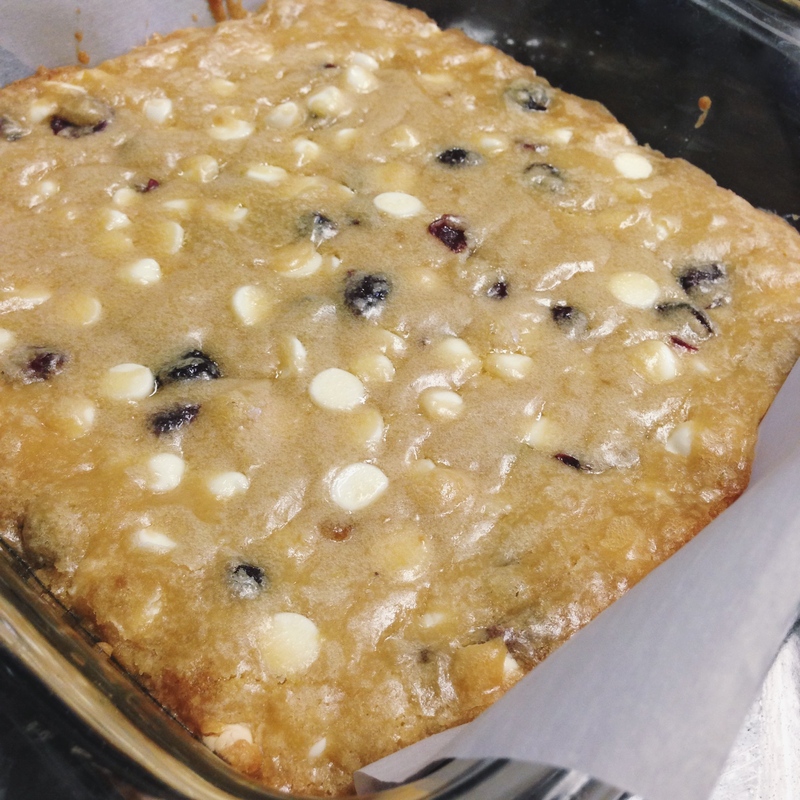 Fold in white chocolate and dried cranberries. Pour batter into prepared pan and smooth it out with a spatula. Bake for 25 minutes, or until light golden brown. It’s a dense and moist dessert, it may still have a glossy appearance, but it’s done when the center has set. Allow bars to cool before frosting them. In the bowl of a stand mixer, add cream cheese, powdered sugar and vanilla. Start by mixing on low, and then beat on medium-high for about 3 minutes. Frost bars. 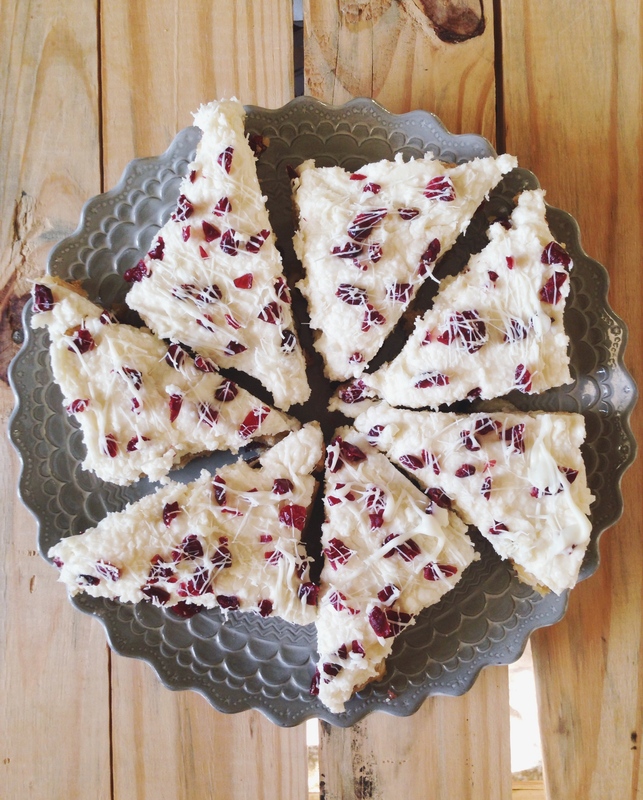 Roughly chop the cranberries and sprinkle them over the frosted bars. In a small microwave-safe bowl, melt the white chocolate chips according to package directions. 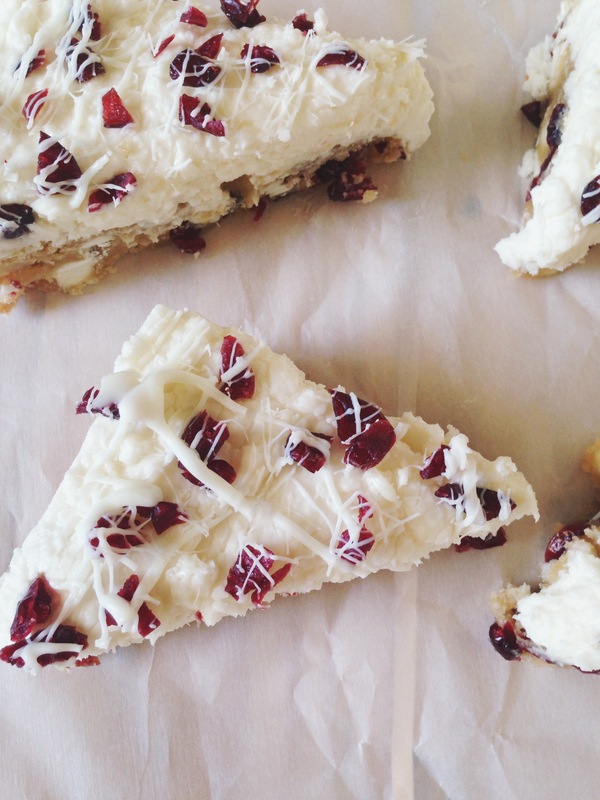 Drizzle melted white chocolate over the bars. Let dessert sit for 30 minutes before slicing. Store bars in an airtight container in the refrigerator. Thanks so much! I hope you give them a try! Ohhhh my gosh these look and sound sooo awesome. Will make for our Christmas Eve gathering…sooo glad I found you. So excited about so many ideas for this holiday to do with our youngest 10yr. Granddaughter…I sent away for a bag of spearmint candy to do the ornaments along with the peppermint. Can’t wait to do them…will have to send pic. You’re so sweet, Sandi! I hope you enjoy this recipe and the peppermint ornament project. Thanks for taking the time to comment!